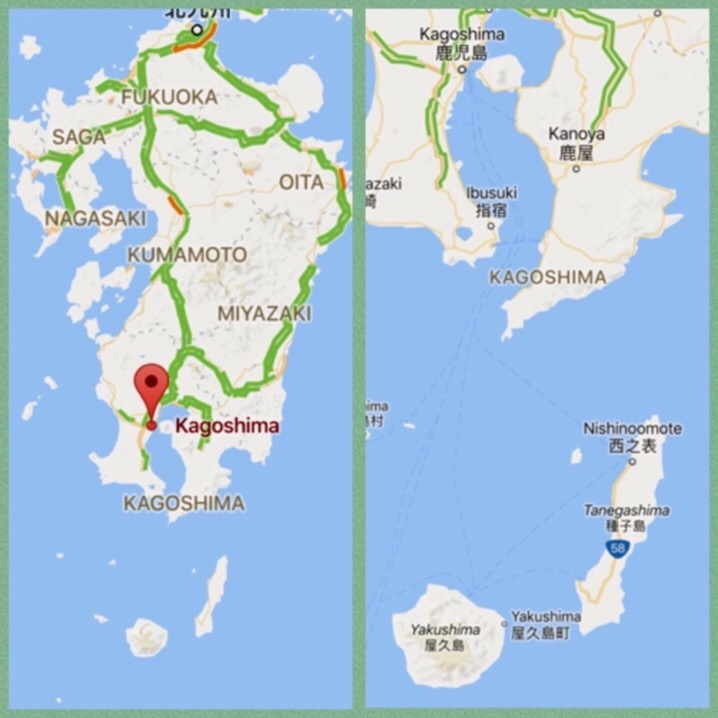 KAGOSHIMA, JAPAN - It was our third visit to Kagoshima prefecture on Japan's south island of Kyushu. From Thailand we flew with THAI to Fukuoka an easy 5 hour flight and from there a comfortable Shinkansen train ride on the super smooth bullet train. We wanted to see new sights and traveller experiences. Fortunately Kagoshima has a basketful of treasures to choose from. 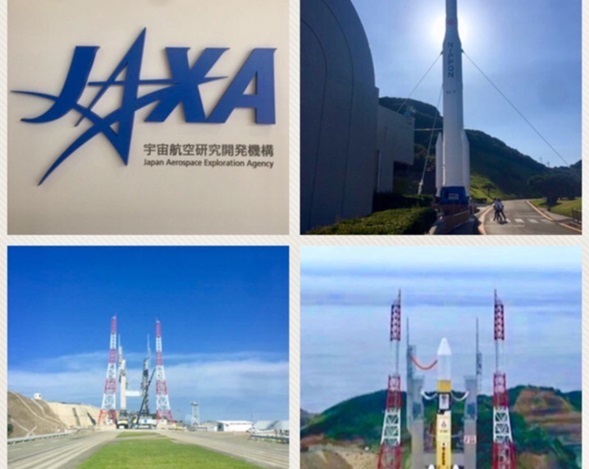 I particularly wanted to visit the JAXA space centre on Tanegashima Island and watch turtles lay their eggs at Turtle beach on Yakushima Island. 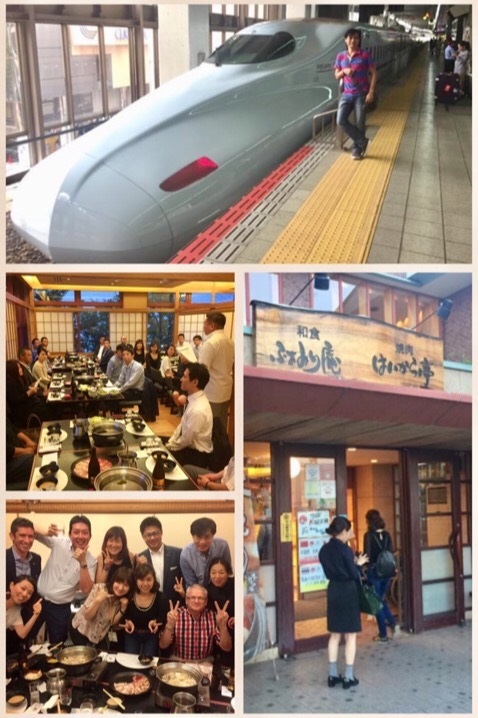 Day 1: We landed safely and took a short Shinkansen train ride from Hakata station to Izumi station. We travelled up the mountains and into the forests around Isa City for a special black pork lunch at OKB (Okita Kurobuta) Farm, where they rear their own famous black pigs. They roam the forests in the area. The BBQ pork and cold beers were great! Afterwards we checked into the Ryokojin Hotel Sanso (a hot springs mountain lodge) in Kirishima. The hotel opened in 1917 so it's celebrating its centennial this year. Before unpacking we headed straight to the onsen (bath-house) for a refreshing soak in the natural waters from the hot springs that has made this region famous as a spa destination. It was wonderful to bathe and relax before changing into Yukatas (cotton robes) for a traditional Japanese dinner, with so many delicious courses I lost count. 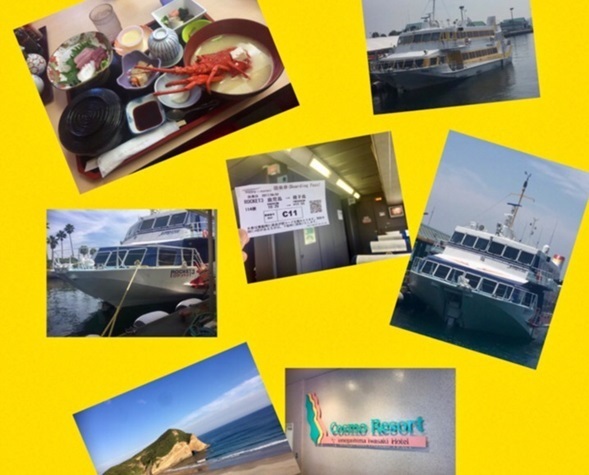 Day 2: After a good sleep and early breakfast we checked out to catch the high speed ferry to Tanegashima Island from Kagoshima port to visit the JAXA space station and overnight stay. Tanegashima is one of the Osumi Islands belonging to Kagoshima Prefecture, located approximately 40 km south of Kyushu. The island, 445 km² in area, is the second largest of the Osumi Islands, and has a population of 33,000 pax. Access to the island is by ferry or air. The JAXA run Tanegashima Space Centre (TNSC) is a Japanese space development facility. It was established in 1969 when the National Space Development Agency of Japan (NASDA) was formed, and is now run by JAXA. It is Japan's largest space development centre. Orbital launches of the H-II rockets take place from the Yoshinobu Launch Complex. Yoshinobu has two launch pads. There are also buildings for assembly of spacecraft, and for radar and optical tracking of launched spacecraft. On days of rocket launches, space enthusiasts from all over Japan gather on the island. A model of a rocket welcomes visitors. The Space Museum displays various materials, such as the propulsion system of a rocket and details of famous Japanese astronauts. We had booked a guided tour of the facilities (advance reservations). We moved around the expansive site on a bus, and even approached the launch pad. An amazing tour. We also saw the rocket components and the control centre. 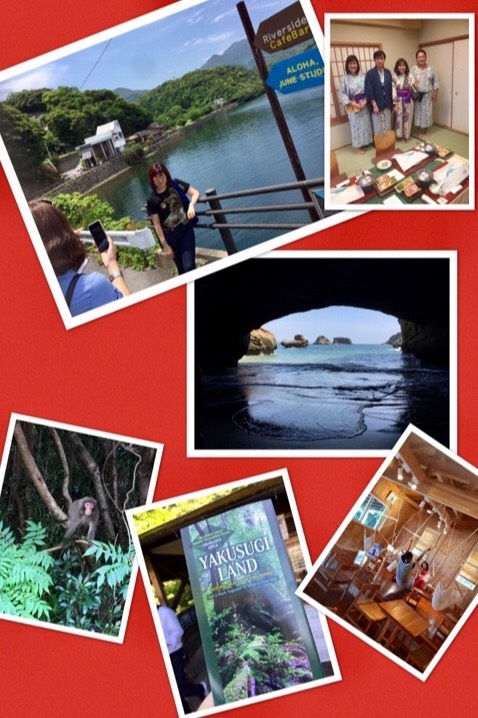 This is the only site in Japan that offers such a tour. It was an outstanding visit. Thoroughly enjoyable with great exhibits and tours. You must visit the space shop afterwards! Day 3: After another good sleep and fabulous breakfast at the Cosmo Resort located just 5 mins from the JAXA space centre, we were off - first stop the Hirota Site Museum. Located by the sea, near the Space Centre, the Hirota Site is the remains of an ancient cemetery dated 3 BC to 7 AD. About 160 sets of human bones and 44 thousand artifacts made from shells have been excavated at this site. Due to its unique location and artifacts, the site was designated as a National Historic site in 2008. The museum exhibits show how the people lived at the time, and how they were buried. This was followed by a visit to the amazing Chikura Cave (Chikura No Iwaya - the cave of 1000). The cave is huge and can hold one thousand people. Although we were pretty much alone, with only a handful of visitors. After the caves we drove north back to the ferry port to visit Yakushima Island. The trip is approx 1 hour by high speed ferry. Once there we had a late lunch at the wonderful Riverside Restaurant. Firstly we visited Yakusugi Land - a forested trial and home to 1000+ year old cedar trees. Raw nature and pristine forest. We saw deer and many varieties of birds. It was a warm day. We stopped for ice cream at Yakushima Gelato Sora Umi (Sky and Sea). Afterwards we drove to our hotel, the Yakushima Iwasaki. On the way we saw a few monkeys. The island has more monkeys and deer than people. We managed a quick visit to the wonderful (huge) onsen in the hotel and changed before heading off to dinner. At 21.15hrs with dinner finished we set off to turtle beach a short drive away at Kurioshima. Turtles had been seen earlier in the week. Would we be lucky tonight? After a wait of about one hour in bright moon light (we were told it maybe too bright for the turtles to come out tonight), then we had the good news - a turtle had been spotted! It was cool about 17°C (63°F) I had brought a sweater and was grateful for it. We all lined up (about 20 pax) and were taken to watch silently as the sea turtle prepared her nest in the sand and lay her eggs (over 100 soft round ping-pong ball sized white eggs). We were told we couldn't use flash photography and could only stay behind the turtle. I think it was a loggerhead or a leatherback turtle although the locals called it a blue turtle. 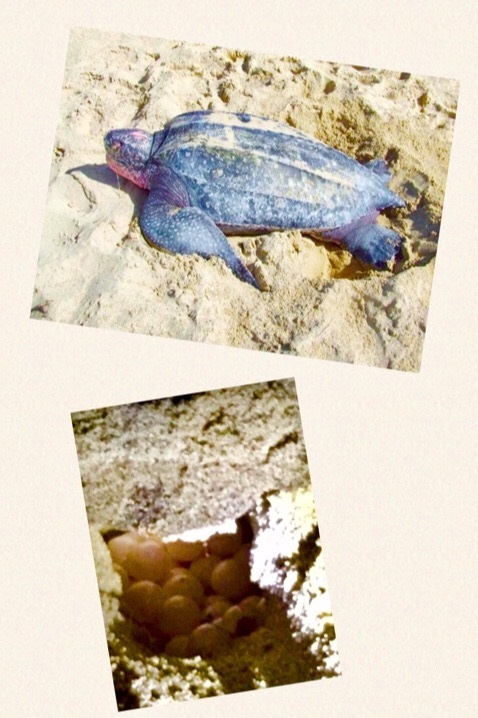 The season for egg laying is May-July when they would expect 500 turtles on this stretch of beach. With only one flash light from the guide we were able to watch this amazing animal that had returned to the beach where she was born and dragged herself up the beach to the sand dunes above the high-water mark and dug a huge hole, deep enough to lay her eggs. A wonderful unique and moving event. A once-in-life-time experience. Sea turtles take 30 to 40 years to mature. They lay eggs every two to four years. 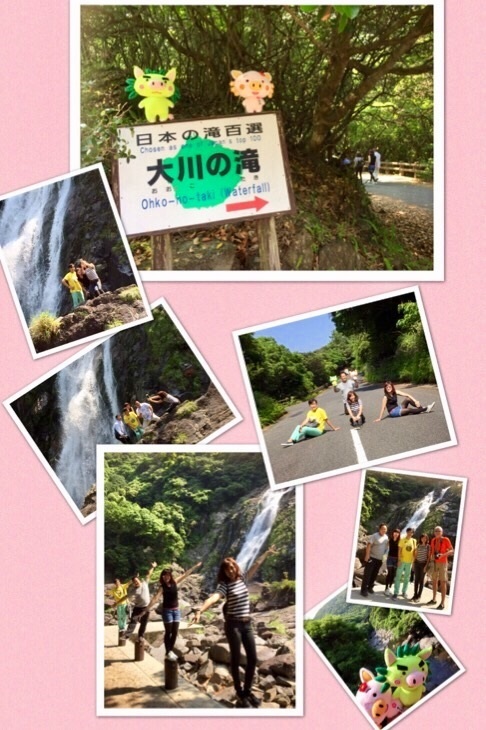 Day 4: A good visit to the thundering Ohko No Taki waterfall (one of Japan's tallest). It was a beautiful day, bright sunshine and clear blue skies. This was followed by a visit to the Yakusugi Museum to look at the history of forestry management among giant cedar trees many 000's of years old. We came to support the Thai player - Khun Sitthichok. His team KUFC won 2:1. The teams were well supported and there were many families with young children among the supporters. Outside the stadium there were great food vans selling a wide array of delicious snacks and drinks. It had a fun carnival atmosphere. Picture of Sakurajima volcano taken from Kagoshima Bay as we arrived by ferry from Yakushima Island. Sakurajima used to be an island but is now connected to the mainland from lava flows on the east side. It is still active and spews out dust and rocks. Day 5: Today we drove 40 km north west to Ichikikushikino City to visit a Shochu distillery. 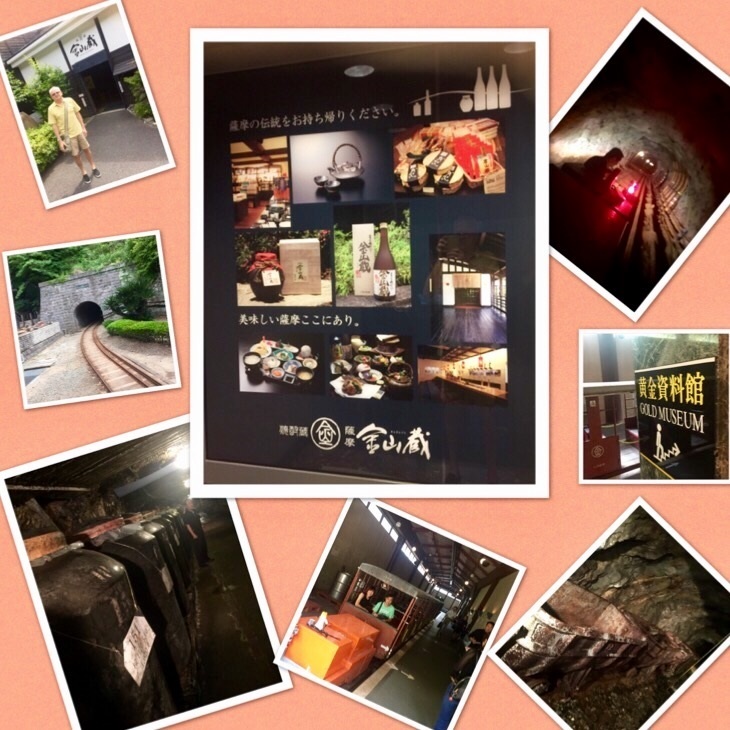 The Kinzangura Shochu Factory is located in a gold mine and accessed by a miniature railway deep inside the mountain. We later visited the Maguro No Yakarta fish market and restaurant, for lunch. It's a great restaurant and retail area. The building looks like a ship with a mast and port holes along with a wheel house. Later we visited the Satsuma Students Museum. 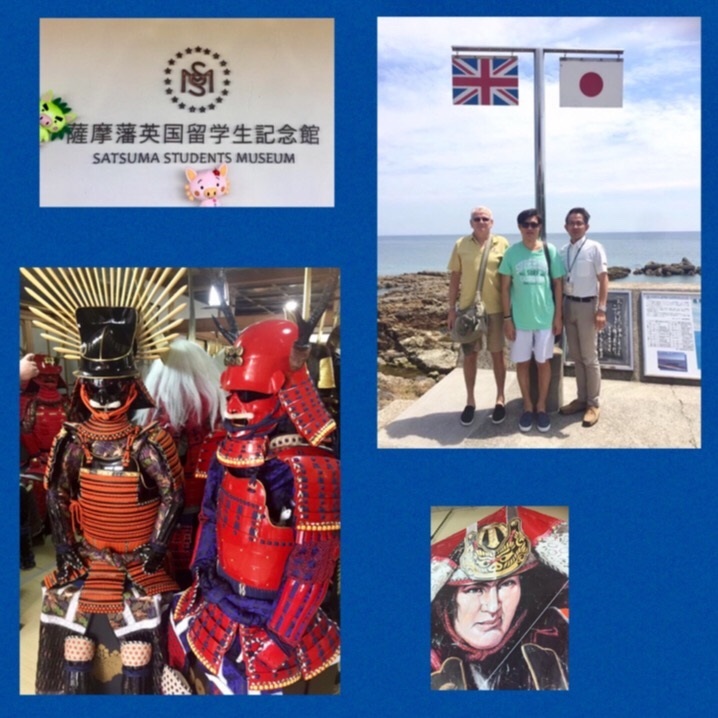 The museum is dedicated to Satsuma students who travelled to the UK in 1865 to study advanced technologies, and later contributed to the modernisation and industrialisation of Japan. An amazing story of how 19 young men 13-20 yrs, old sent from Satsuma and arrived in Southampton, after a 2 month voyage. They travelled throughout the UK to learn about industry and technology returning two years later to Japan, to share this information. 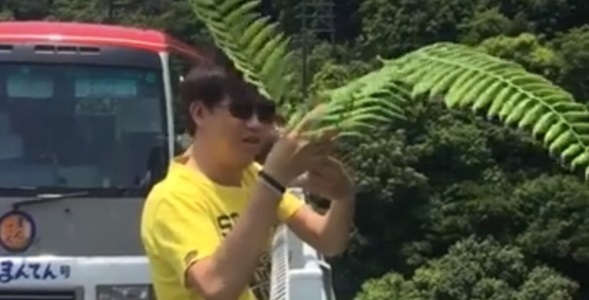 A pivotal moment in Japan's industrial history. Next we visited the amazing Yoroi armour factory (makers of replica Japanese Samurai Armour). It's a traditional SME local community factory with all items made by hand on-site. Suits take 1-2 months from order, many for boys (a traditional gift when boys reach 5 yrs old) but the factory makes suits of armour for anyone. They often feature in films and historical TV dramas. A full sized suit can cost ¥ 400,000 (approx US$ 3,500). In the evening we had dinner with friends and members of the local tourism industry. It was a farewell dinner. Tomorrow we leave this amazing place and head home.